Following on from their first leg matches, both Lech Poznań and Arka Gdynia look to have one foot in next month’s Puchar Polski final. The Ekstraklasa sides both managed 3-0 victories, against Pogoń Szczecin and Wigry Suwałki respectively; and will hope to either maintain or extend their leads in order to reach the showpiece at the Stadion Narodowy on May 2nd. However top-flight Pogoń and second-tier Wigry now have 90 minutes to salvage their tournament, and will not want to give up their dream lightly. 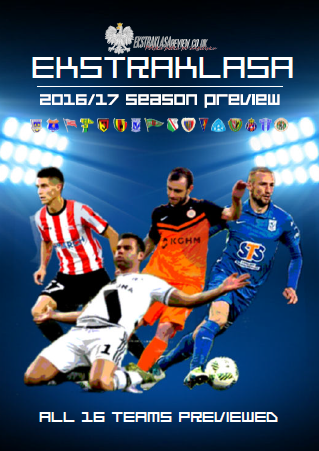 EKSTRAKLASAreview.co.uk has teamed up with oz.com to offer Full HD streaming of the Puchar Polski 2nd Leg games for Polish football fans in the UK, USA, Canada, Argentina and Brazil. Just click on the above link, and go through a short registration process to watch this week’s games for FREE! As a bonus, EKSTRAKLASAreview’s very own Ryan Hubbard will be providing commentary on the service for Wednesday’s game between Pogoń and Lech. Pierwsza Liga side Wigry Suwałki make the journey to Pomerania on Tuesday afternoon, with revenge for February’s three-goal drubbing on their minds. Goals from Mateusz Szwoch, Rafał Siemaszki and Dariusz Formella put the Arkowcy in a commanding position in the country’s north-eastern corner, and will surely feel confident of defending their lead against a team six places below them. But that first leg was five weeks ago, and a lot can change in five weeks. Back then the Pierwsza Liga was still in the throngs of its Winter break, and Wigry had not played a competitive game since November. Arka meanwhile had come off of the back of a 4-1 battering of Korona Kielce, and carried that form to their trip to the Podlaskie Voivodeship. Now, it’s the second-tier side who are in the better form, having won three of their five games this year; while their opponents have failed to collect a single point from their last three outings. Arka’s defeats have been heavy too, shipping 11 goals in their trio of outings including four in the weekend’s home defeat to basement club Górnik Łęczna. With 21 goals between them in all competitions, the Wigry attacking pair of Kamil Adamek and Damian Kądzior will hope to be able to take advantage of the leaky back line. But if Wigry harbour hopes of an improbable cup final, they’ll need to guard against a leaky defence of their own, having conceded 32 times in the league this season. Maintain those standards, and it could be a long night for Dominik Nowak’s team. If Wigry’s 3-0 defecit looks tough to overturn, then Pogoń Szczecin’s looks almost impossible. To stand a chance of progressing to the final, the Granato-Bordowe have to score at least three goals against a Lech side which has not conceded that many times in their last ten outings combined. Even if they do somehow manage that, they’ll have to keep quiet an attack which has plundered 19 goals in the same period. If there is any glimmer of hope for the hosts, it is that tournament favourites Lech have dried-up in the goals department in the last few weeks. Goalless draws at home to basement club Górnik Łęczna and away at Wisła Kraków will give Pogoń an idea of how to keep the Kolejorz attack quiet, even if it does little to help them find a way past a watertight defence. Recent history is also not on Pogoń’s side, with each of the last three meetings between the sides seeing Lech hit the back of the net three times. In reply, Pogoń’s only goal in those trio of clashes was scored by Łukasz Zwoliński – a man currently plying his trade away from the club. Instead they will look towards Bulgarian international midfielder Spas Delev, fresh from his brace against the Netherlands, and his Hungarian counterpart Adam Gyurcso to provide the sparks. They could also do with striker Adam Frączczak adding to his season’s tally of eleven. But realistically, the goals scored by Szymon Pawłowski, Dawid Kownacki and Lasse Nielsen should be enough to see the Railwaymen through; and the biggest surprise would be if they fail to make their margin of victory wider. Remember, both games – including live English commentary on Pogoń – Lech – are available for free over at oz.com. Just click the link, register, and you could be watching the Puchar in Full HD.